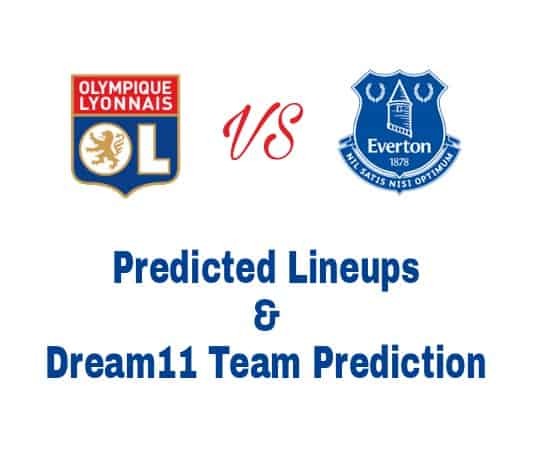 Hello welcome to Lyon vs Everton Dream11 Football Team Prediction, Fantasy Preview, Predicted Lineups and Team News. We cover LYN vs EVE Dream11 Team Prediction and Predicted lineups. Olympique Lyon vs Everton Will be played on 02/11/2017 at stade de lyon – Dencies. Lyon have scored 2 goals, while Everton have scored 1 goals. Olympique Lyon won that match by 2-1 goals. Lyon have scored at least 2 goals in their last 4 matches in all competitions. Everton have lost their last 4 matches. Lyon won their 4 previous matches. Lyon have no doubtful players, no injured players and no suspended players. David Unsworth will be without Wayne Rooney, Leighton Baines, Phil Jagielka and Michael Keane because they have not travelled to Lyon for Thursday’s Europa League match. Keane has a foot injury and the other three have been rested, while 18 year old defender Morgan Feeney makes the trip. James McCarthy is Doubtful Players for Everton. Lopes; Marcal, Marcelo, Morel, Tete; NDombele, Tousart; Depay, Fekir, Traore; Diaz. Pickford; Martina, Holgate, Williams, Kenny; Schneiderlin, Gueye, Mirallas, Sigurdsson, Vlasic; Calvert-Lewin. Note; This is Tempory Team Prediction because in Europa League 90% Matches Lineups Come before deadline. so if lineups come then update your dream11 football team. Lyon is strong team than everton so take more players from lyon’s side. Lyon’s 4 Defenders are also good in this match. Other Captain and Vice-captain Choices Are B Traore, G Sigurdsson, C Lewin and Lyon’s GK and Defenders. If you liked this article LYN vs EVE Dream11 Football Team Prediction, then please subscribe to our Email Newsletter For Latest cricket News, Fantasy Previews, Playing XI and All information about Dream11 Fantasy Football. You can also find us on Google+ and Facebook. Ya bro you are right, so we already mentioned that in Europa and Champions league you need to update Dream11 team otherwise you can’t win. In this match if you read our suggestions then you created good team. If you watch Everton players then mostly users 2-3 players didn’t play out of 4 Everton’s players because Everton lineups not come before deadline.